On the present, Our commentator girls start saying what it is to come, that the girls from the exhibition will be coming today since the championship is very soon, they also explain a little basic info about the Side-Car racing; at the same time they say the prize…The team that is the big winner will go to London to the Isle of Man TT! Meanwhile both Megumi and Yuri where doing their normal chores at their respective inns, like cleaning or cooking, suddenly their Mothers remembers them about the upcoming visitors, so both girls picks their respective vans and drive towards the appointed place. In there, there where the Police officer and the girls from the news club who are covering the arrival of the other competitors, who are the same girls presented on the exhibition race, while waiting the girls talk about the whole romantic triangle between Megumi, Yuri and the Coach who went to England. 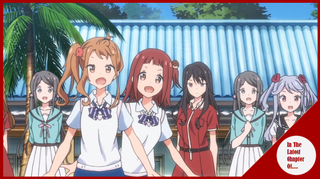 Finally the girls have reached their destination and both Megumi and Yuri come along, while on the track they are rivals, outside of it all of them are very friendly with each other and it seems all of them know each other very well. In any case after that it seems that most groups got divided into driver and assistant and ach one of them will be on either Megumi or Yuri´s inn, also the announcers and the news club girls will be on the inns during the tournament…Gonna get the scoops! Anyway, after some chit-chat the desire for all the girls to test their machines is too great, and using the pretext to “see if the bikes endured the trip´” went to check them out! All the girls get up and it seems that one of the chicks, Misaki, is having some weird problems with her companion, still each and every one of them goes to the place where the Bikes are allocated and start seeing them, it seems everything is in order. Some of them start cleaning and doing some general work on them, although others are eager to use the bikes and “test” them, so some teams start doing that, between them the owners of the Ashitabamaru, Megumi and Yuri, who wants to win the Championship, go to the Isle of Man TT and expose their true feelings to the coach! Of the other teams the one where Misaki is, both start driving and Misaki is checking if everything is in order… She starts remembering. Misaki is a girl of a working family, and the institution where she is is somewhat expensive so after school she goes to work, she doesn´t have too much friends and she is a loner,s till one day the rich girl with a lot of fans, Chiyuki Shiohara, has invited her to join the side car racing club, Misaki was not interested and more focused on working, still Chiyuki is set on making her partner. Chiyuki explains that she lost her partner a little while ago, so she is in needs of other person, and the loner Misaki is perfect for the job! Misaki still keeps saying no, although Chiyuki then start saying that she can move her influences and revoke that permission she has to work and study at the same time… Misaki is pissed of that she might blackmail her! Especially because she doesn´t know her family situation! Chiyuki says that if its about money, then she will pay her to be on the club and even pay all of her club expenses…Misaki, now calmer and flabbergasted, ask her why it has to be her? Chiyuki gives a non answer; but she says that she aims to win the Championship, and Misaki is necessary for that, none other could make the job. Back on the present, it seems that all of the motor stuff is A-Ok, so now the girls from Suzuka Girls Academy will start running like if they were serious! An improvised race starts going between the girls on the track! On the case of the Suzuka girls they keep getting better and better like if they were a single unit, two bodies, one sole mind. A curve is coming and Chiyuki took her a little close, Misaki puts her weight and her head is dangerously close to the pavement of the street! Suddenly Chiyuki makes a break and Misaki is now all pissed off with her! Sinc eit seems she is not serious about this stuff of winning the championship! What Chiyuki didn´t tell is that when she decided to break it was because a flashback came to her mind, a memory of something that happened, although… nor Misaki, or we the viewers know in detail what happened on her in the past. On the vicinity, Megumi and Yuri are watching concerned. An Entertaining chapter this time around! I liked how it got explained the rivalry and the reason behind why Yuri and Megumi aren´t so nice between them as of right now…And yeah it is because both have their eyes on the same guy. Still the story has show them a new objective and it´s to win this championship and go straight to England to the Isle of Man TT and confess to the coach! One thing that Is aid on the previous chapter, and it is still with the series this chapter is the good chemistry between Yuri and Megumi, seeing how both of them interact with each other is very well executed. Other important point is the one between Misaki and her companion whose name is escaping me right now, mostly because the dichotomy between both characters and the reason on why the driver wanted her as her Companion on the first place? At the same time it will be interesting since we can see their objective and reason to win the championship. All in all it has been enjoyable, although it feels like all of this is a preparation for what it is to come. So let´s hope that the payoff is worth it!